In this tutorial I’ll show you how to make your own stencils from recycled food container lids and use them to decorate personalized gift packages. Many of the stencil designs I used in my demo were traced from nostalgic Christmas cookie cutters that were passed down to me from parents and grandparents. They bring back a lot of happy memories of doing holiday crafts and baking with my Mom. Most of the time making things in preparation for the Holiday was more fun for me than the actual event! I designed this project to be something you can do with kids, but I think anyone who enjoys being a little bit playful and making eco-friendly packaging would enjoy this – I know that I had a great time! 1. Take an old plastic food container lid and cut off the rim. 2. Choose a cookie cuttter or some other object to use as a template and trace around it with pencil on a piece of paper. Or if you have no such object, draw a simple shape of your choice. 3. Place the food lid piece over the drawing and trace the outline with a permanent marker. Cut out the shape with a craft knife, scissors, or some combination of the two. 1. If you are using the backs of recycled grocery bags, you can get a lot of the folds and wrinkles out of them first by ironing them between pieces of clean scrap paper. Spread paper down on your work surface and tape edges to hold in place. 2. Dab some chalkboard paint onto an old food lid and dip a small sponge into it. 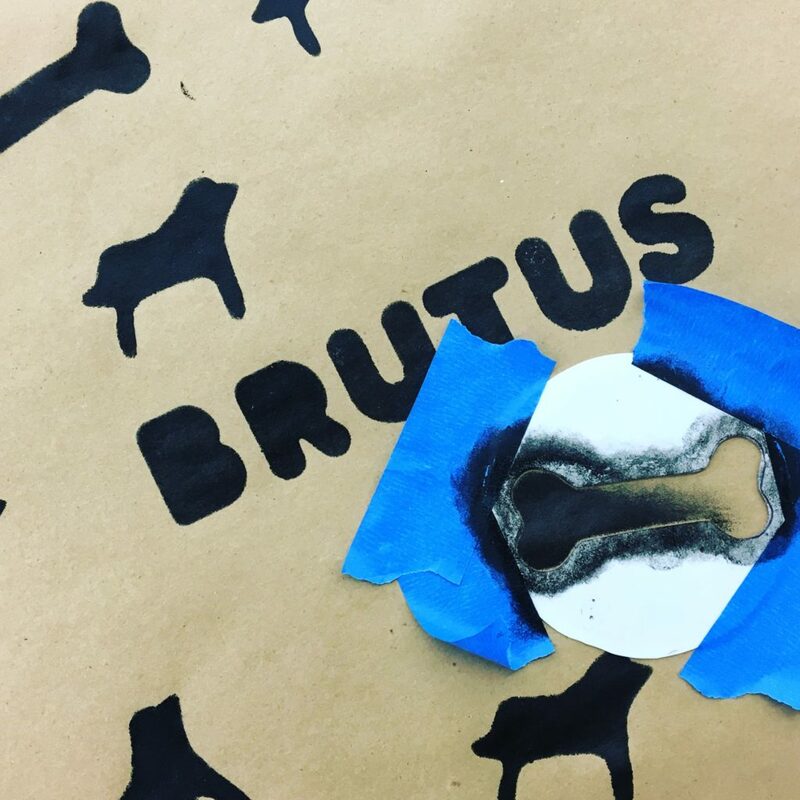 Place your stencil on the paper and tape down if necessary to hold it steady. Dab the sponge gently inside the cutout area and slowly apply the paint. Increase the amount of pressure and paint if necessary to get full coverage. If you apply the paint gently and gradually, you can avoid applying too much and having it bleed under the stencil. Here I am stencling chalkboard paint onto the kraft paper. 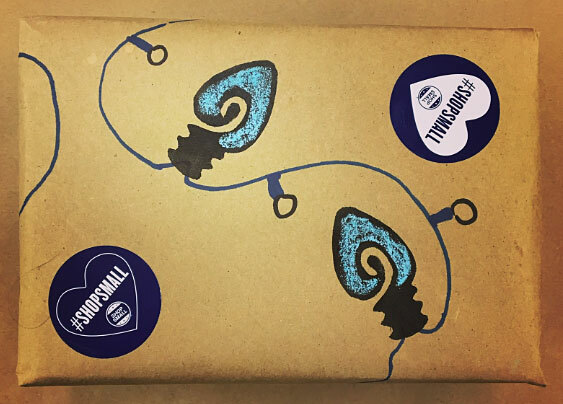 I recommend that you apply the chalk after wrapping the package, but in this demo I drew with chalk on some of the shapes while I was still stenciling so that people would see the possibilities of the chalkboard paint. 3. Lift stencil straight up to avoid smearing and repeat until the whole piece of paper is covered to your satisfaction. Let the paper dry. 4. Wrap the package after the paint is dry. 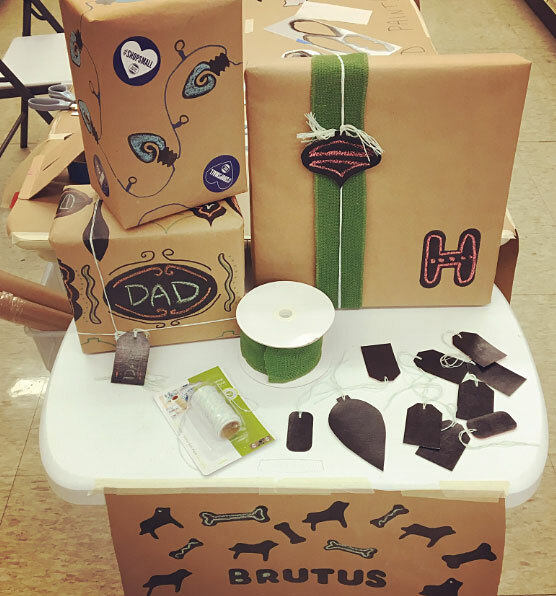 Here is a selection of wrapped boxes and decorating materials to give you an idea of how you can combine markers, stickers, ribbon, twine and tags with your chalked designs. Tip: If your package is going to get handled a lot before presenting, you can spray your chalk work with spray fixative to protect it. Spray fixative is a product artists sometimes use to protect pencil, chalk, pastel and other media that might smear, and it is available at art supply stores. Drawing with both markers and chalk is great fun! 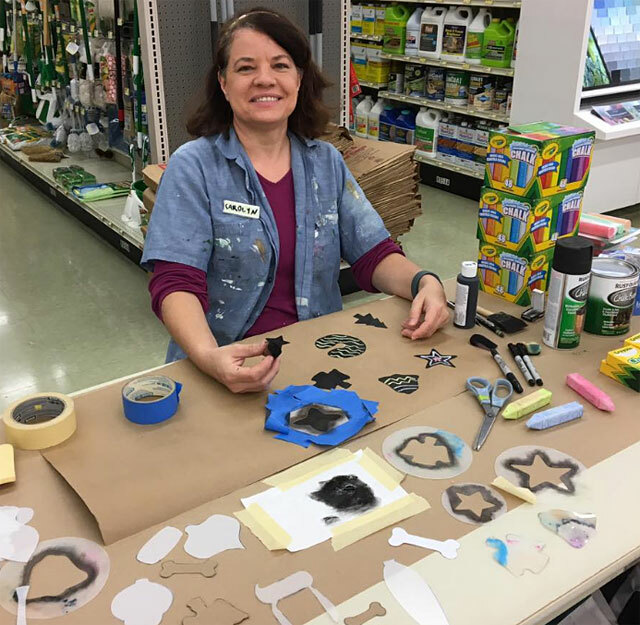 On this sample, I sponged the chalkboard paint around a cutout star that was left over when I made a six-pointed star stencil. 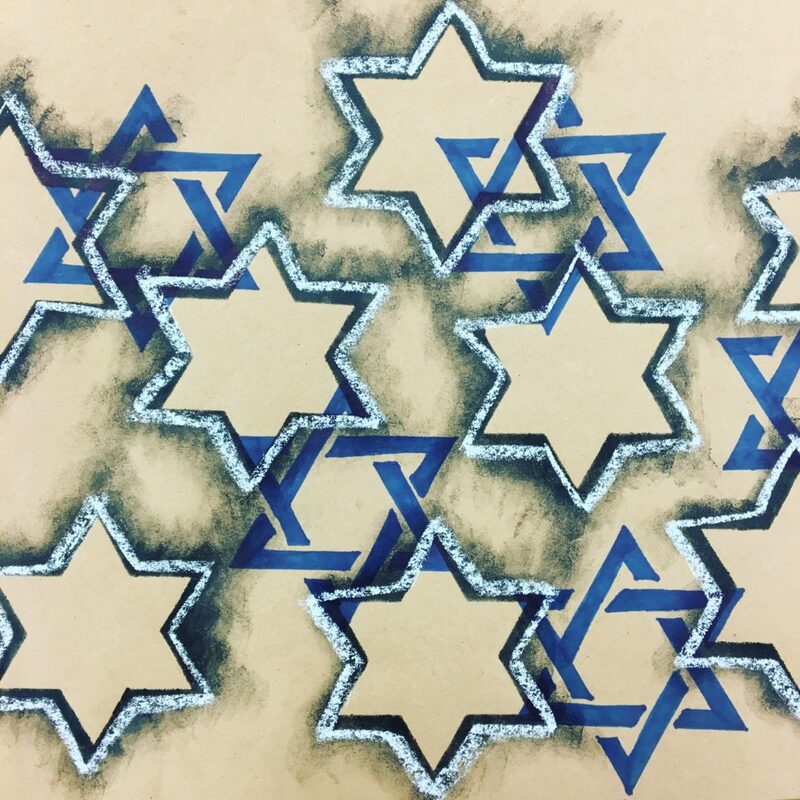 Combined with royal blue marker drawn through another stencil and light blue chalk I made a Hanukkah design. 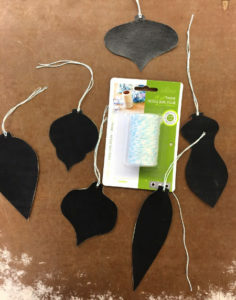 It’s easy to make chalkboard gift tags to go along with your chalk-enhanced gift packages. 1. Paint some chalkboard paint onto one side of some scrap chipboard or card stock and let dry. 2. 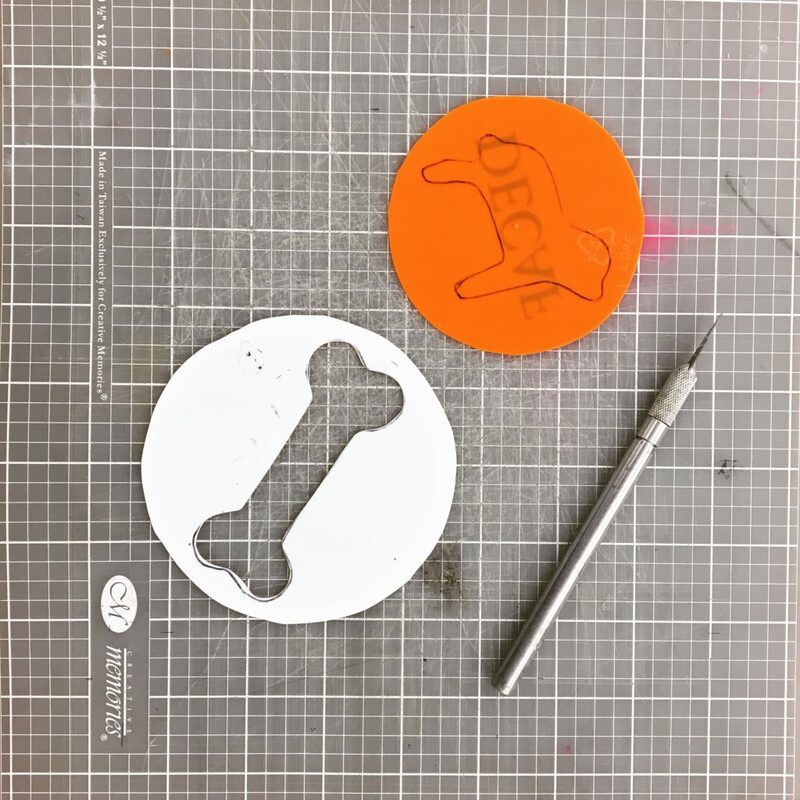 Use your stencils to trace shapes onto the unpainted side with pencil and cut out. You can make your tags tag-shaped or any other shape you like that fits your theme. 3. Punch a hole at the top of your tag and attach a piece of ribbon or twine using a lark’s head knot. 4. Use chalk to write on the tag and protect with spray fixative if necessary.